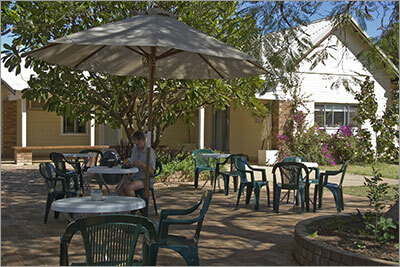 Our first day in Carnarvon was at the Plantation Caravan Park which is 5 km out of town at the intersection with the North West Coastal Highway. We only booked one day here as the apartment we booked for the rest of the week was not available until tomorrow. The park is located amongst the plantations that run along the banks of the Gascoyne River where a lot of fruit and vegatables are grown for the WA markets. The Gascoyne is not running this time of the year but all the irrigation water is drawn from the aquifers running beneath the sandy river bed. A few kilometres from where we are staying the roads that run along either side of the river form what is known as the “Fruit Loop” and if you follow them you get to visit the produce stores out the front of each of the plantations. We were told that the coffee at the Gascoyne Fresh Company’s café along the route was well worth a stop so we took a ride out there this afternoon. Our selected coffees and cake lived up to their reputation and we returned with tomatoes, beans and zuchinnis for the rest of the week. 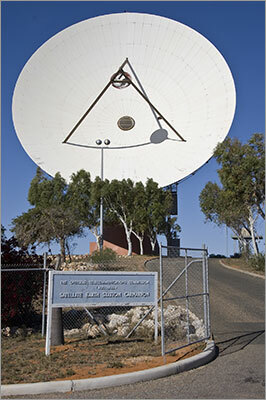 On our way back to the park we stopped at the OTC communication dish which overlooks Carnarvon. First opened in 1966 it was Australia’s first satellite communication ground station and was involved in the Apollo moon missions. Before it closed in 1987 it was use to control the Giotto Probe to Halley’s Comet. From what we could see the dish lookout seems to provide the highest point to look at the district. The road south which we will take late next week seems to be very flat all the way to the horizon. Zoom into the map and use the 'Satellite' layer to see our new location. 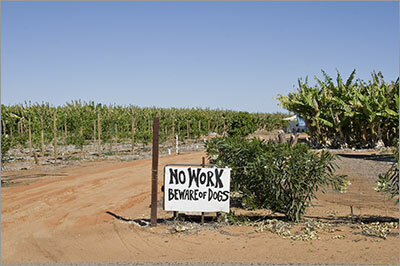 All the farms have "No jobs" or "No work" signs at their gates. This sign is obviously there to deter those who cannot read. 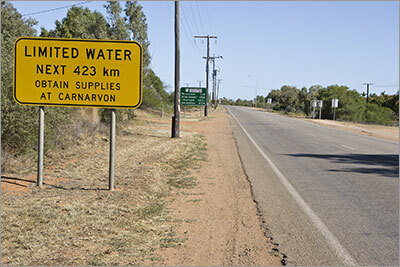 A sign on the road south of Carnarvon. Something we will need to contend with in 7 days time!